Zachariah Twamley was born at New Shipton Farm in Sutton Coldfield in 1773, one of a large family. His father was the miller at New Hall Mill, and Zachariah followed in his father’s footsteps - for many years he held Castle Bromwich Mill on the river Tame. When he retired he moved back to Sutton Coldfield, the 1851 census records him living in a small house where the Red Rose Centre is now on Lower Parade; he is described as a “retired miller and yeoman”. After a life-long interest in Sutton’s history and politics, he sat down at the age of 82 to write a history of the town - the unpublished manuscript is in Sutton Reference Library. Twamley devotes several pages to mills in Sutton, giving us a snapshot of their state in 1855. Beginning with Longmoor Brook, he mentions Longmoor Corn Mill and the Powell’s Forge and Mill, outside the Park, where saws, spades and shovels are made and “a good many hands are needed to get and finish them up”. Following the stream we come to Wyndley Pool, where the old rolling mill has been converted into a timber mill, and on into the town where the stream serves a leather mill at the foot of Mill Street belonging to Joseph Pitman Esq. 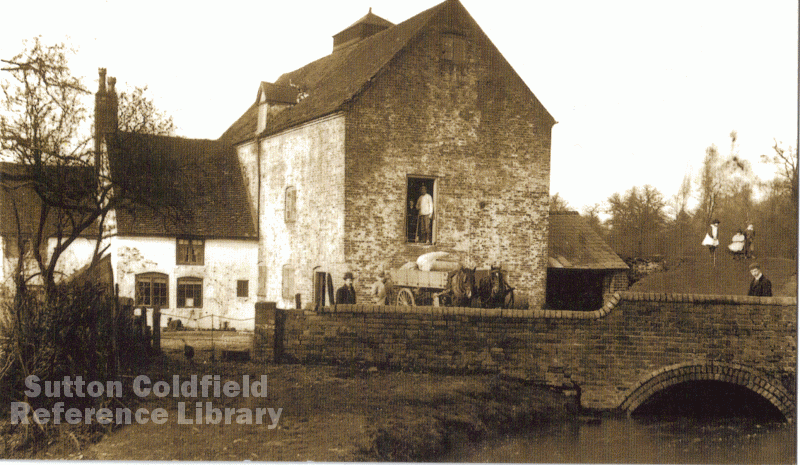 The next mill was Oughton’s Mill, which stood where Plantsbrook School is now. Twamley says that in 1855 it employed only a few hands in boring and grinding gun barrels; “this kind of work being principally done by steam power at Birmingham makes country Water Mills of little value”. Moving downstream to New Hall Mill, which was for grinding corn, “the family of the Twamleys were occupiers of the mill for a great number of years.” This is the only water mill still standing in Sutton, and has been restored to full working order almost as it was as Zachariah Twamley knew it in 1855. New Hall Mill is open to visitors on Bank Holiday Monday, 30th May, and again on Sunday June 12th, 10.00-4.00, when you can see corn being ground in the traditional way. Further downstream from New Hall Mill was Penns Mill, for drawing and spinning wire; they “employ a great number of hands in it, both men and boys. They are reckoned to get up the best music wire of any house in the trade”. This was the most successful of the Sutton manufacturing mills, so successful that it was found necessary to move its premises to a better site in 1860, at Hay Mills in east Birmingham. Though Twamley could not foresee this, he was aware of the decline of the mills that were engaged in manufacturing, with the loss of skilled workers; earlier in his book, he described the closing of the Blade Mill in Sutton Park, where many hands had been employed in skilled ironwork - had these mills converted to steam power and expanded, Sutton may well have become an industrial town. New Hall Mill as Zachariah Twamley knew it.